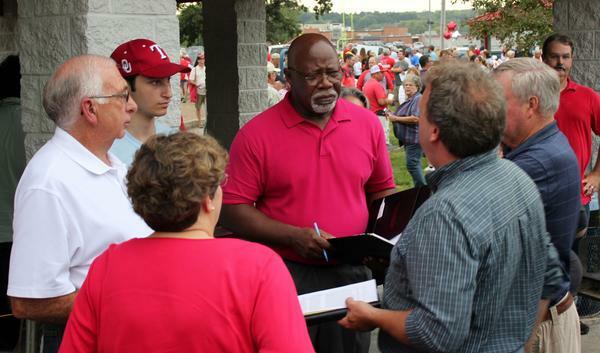 Rep. Willie Dove (center, in red) talking with Rep. Jim Karelskint (left, in white) and other organizers of a public meeting about the Tyson project last year. “No Tyson In Tongie” signs appeared along the highway between Kansas City and Topeka last fall, as residents of the town of 5,000 protested the pollution and the strains on local infrastructure they expected the $300 million facility would bring. Republican Jim Karleskint, the state representative for Tonganoxie, tried to get a law passed that would have given locals more say about proposed poultry operations. That bill didn’t pass, and though Tyson has moved on, Karleskint is still hearing about it. For Karleskint, who’s running for reelection in the 42nd District, it might not be much of an issue. He was against the chicken plant from the start as was his primary challenger, Lance Neelly. The Democrat in the race, Thea Perry, is campaigning on other issues, particularly Medicaid expansion. Things are different in the 38th House District next door where Democrat Stuart Sweeney is gunning for Republican Rep. Willie Dove’s seat. Sweeney says Tyson is one of the reasons he decided to run for the statehouse. He believes Dove only opposed the plant when it became a political liability. “Our homes and our families and our communities are not politics. This is where we live, this is what concerns the people of the 38th District,” Sweeney said. Dove, who’s also facing a primary challenge from Noel Hull, says he was open-minded at first — he saw the Tyson project as a potential economic development opportunity. He did not like how the deal was put together in secrecy, but wanted more information before taking a position. Some of Dove’s constituents interpreted that as support. Though he says he also heard from constituents who saw potential, Dove ultimately opposed the Tyson project. And he voted along with Karelskint and the rest of the Leavenworth County delegation in the Legislature against a measure that allows poultry farmers to pack more birds closer together nearer to residential areas. Politics are changing in Tonganoxie and Leavenworth since the Tyson controversy. There’s a petition to expand the county commission — that approved and then rescinded bonding to support the plant — from three members to five. The city council is now streaming its meetings on Facebook to be more transparent. Council member Kara Reed, a Democrat, who says she too was threatened for not coming out against the Tyson project, is moving out of town. University of Kansas political scientist Patrick Miller says the state House districts around Tonganoxie have been safe Republican seats, but they now represent a mix of rural and bedroom communities. A local issue like Tyson could move the politics closer to a tipping point. “If come Election Day, this is a surprising race or something that’s unusually close, you might look back and say this seemed to be an important issue in changing how this district normally turns out,” Miller said. At the recent Tonganoxie Days festival, staff for state Sen. Caryn Tyson worked the crowd. She’s running for Congress in the 2nd District and her campaign seems to be aware of the political winds. Michael Murray was making it clear that Caryn Tyson has no relation to the company Tyson.